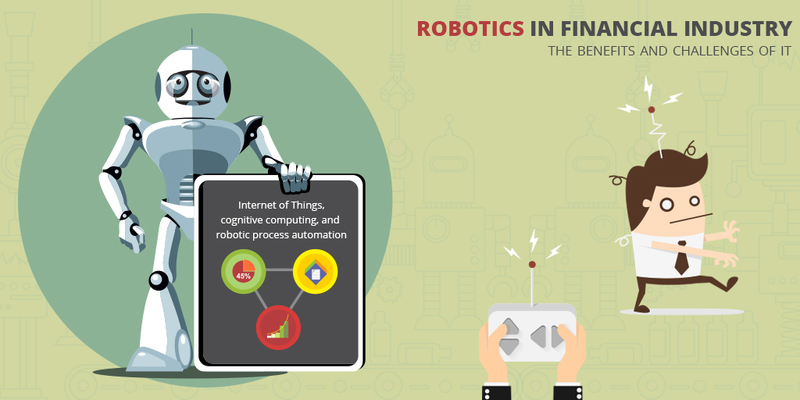 HomeTechnologyRobotics in financial industry; the benefits and challenges of it. Robotics in financial industry; the benefits and challenges of it. The emerging and unconventional technologies such as Internet of Things, cognitive computing, and robotic process automation are set to transform our world. Based on artificial intelligence and machine learning, the Robotic process automation is proving to be a game changer in the industry by bringing in unique operational efficiencies. The financial industry which is known to employ plenty of people is at a critical juncture presently. Banking, capital markets, insurance and all such financial service institutions are now adopting robots for significant security, data quality, audibility and resilience in their operations. The Bank of Tokyo- MUFG deployed Nao, a 5.4 kg and 58 cm tall robot who is equipped with a camera, microphone, 19 different languages, remote control and visual recognition capabilities so that it can interact, communicate and solve the queries of the customers in the branches. Jobs like verification of customer details, passbook updating, cash deposit, salary uploads are being done by robots now, replacing humans. As per the CB Insights, the investment into robotics has risen up by 115% from 2011 to 2015, marking that robots have indeed become smarter and faster. The current landscape where competition, complexities, and regulatory regime are challenging the bottom lines of the financial sector, the robotic process automation is out shining with significant positive outcomes here. The tasks, performances and process quality are now more streamlined and effective. From back offices to front desks, robotic automation is applied to a variety of tasks, resulting in a cost cut down by up to 75%.Further, this automation is making easy to handle the high volume of transactions as well as increase new variety of services to attract more customers. Undoubtedly, the potential is enormous and many investment banks, exchanges and clearing organizations are also in the early stages of adopting it. But the challenges come along.The prominent amongst all challenges is the upfront capital investment required for this robotic process automation. A huge investment which needs to justify the returns and differences within the organization. Another impact would be on the staff working in the organization as the roles will be redundant and the robots will be configured. There will be an intense change in the entire management as the staff will be redeployed, reskilled and retrained at different levels. Obviously, there is a perception that robots lead to staff attrition but the truth is that the robots replace humans in dull processes and empower them to do something more creative and productive. Aside from this, the entire concept of having digitally connected robot workforce leads to the potential exposure of cyber security threats. The software programming of robots will be connected to other technologies like the internet of things and chances of online malice increases. A clear strategy and framework for robotic automation should be there in place to avoid these threats. In the end, I remember, Kevin Kroen, partner, financial services advisory said that “ Digital labor is giving financial institutions a once-in-a-generation opportunity to push a next generation discipline around business process efficiency.” And the financial sector should really consider this change now. Botnets, the bad part of IoT and how to escape it? Ransomware Cyber-attack ? How much do you know about it ? How is quantum computing the next big thing for businesses? How will Kotlin supersede Java? How Big Data and Artificial Intelligence is Changing the E-commerce Landscape?